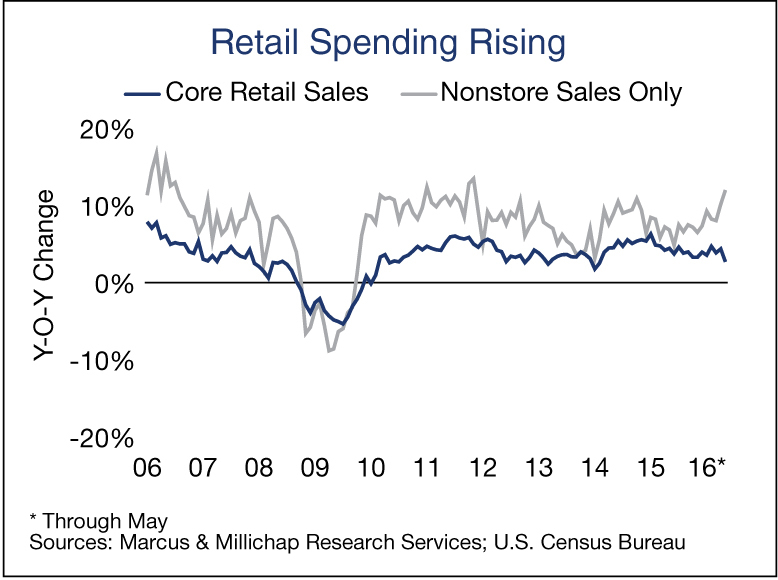 Positive demographic trends continue to generate demand for an array of goods sold through physical and online retail destinations, supporting an increase in retail sales over the past year. While baby boomers and millennials spend money in different ways, the combined two groups account for more than 150 million Americans and spending power in excess of $5.5 trillion, accounting for nearly 30 percent of yearly GDP. The vast scale of these segments of the population has prompted changes across the economic landscape as retailers seek to combine traditional methods and new technologies to capture more customers and sales. The emergence of the millennial generation continues to generate demand for products typically associated with household formation. Spending on the furniture and home furnishings segment advanced 3.6 percent over the last 12 months as millennials start new households or unbundle from existing ones. In addition, homeowners continue to frequently visit home improvement stores as rising property values prompt remodeling, fueling a gain in spending at building material and garden center stores 3.6 percent over the past year. The aging of the baby boomer generation, combined with regulations extending insurance coverage and benefits to more consumers of all age groups, has greatly benefited the healthcare industry. In this segment, drug stores have emerged as clear winners. Sales at these retailers soared 8.3 percent over the past 12 months, driven partly by purchases of medications and healthcare related products. Approximately 57 million Americans will be over the age of 65 by 2020, making up 16 percent of the total U.S. population, supporting a positive long-term outlook for the drug store sector. As the millennial generation continues to grow up, they are fostering substantial growth in demand for apartments. While wealthy, affluent millennials favor urban environments with live-work-play options in lifestyle communities and mixed-use developments, the bulk of this group continues to lease suburban properties where rents are more affordable. This dynamic led to the completion of more than 215,000 rentals over the year ending in the first quarter. During the same period, tenants absorbed in excess of 237,000 units, compressing the nationwide vacancy 30 basis points to 4.2 percent. Tighter operations have also supported robust gains in the average rent as reflected in an increase of nearly 6 percent since the first quarter last year. Rather than spending money on things, millennials are allocating income to experiences, leading the age cohort to drive a 6.5 percent gain in sales at bars and restaurants during the past 12 months. The combined spending power of the generation continues to positively affect the entire hospitality industry. First-quarter occupancy at U.S. hotels hit 60.7 percent, the second highest level on record, and supported gains in revenue metrics. Hotel brands continue to respond to the aging baby boomers and the emerging millennial class by changing design standards and features to suit changing guest preferences. This entry was written by marcusmillichap, posted on June 29, 2016 at 8:41 pm, filed under Uncategorized. Bookmark the permalink. Follow any comments here with the RSS feed for this post. Post a comment or leave a trackback: Trackback URL.